Suzanne Vale, the Hollywood actress, whose drug addiction and rehab rigors were so brilliantly dissected by Carrie Fisher in Postcards From the Edge, is back. And this time she has a new problem: She's had a child with someone who forgot to tell her he was gay. He forgot to tell her and she forgot to notice. Suzanne's not sure she has what it takes to be the best mother to her daughter, Honey. She can't seem to shake the blues from losing Honey's father to Nick -- the man who got the man who got away. Or maybe those aren't the blues, just more symptoms of her sprawling multi-symptomatic bipolar illness: an illness Suzanne can't bring herself to take all that seriously, no matter what her doctors say. How serious can an illness be whose symptoms are spending sprees, substance abuse, and sexual promiscuity? And worst of all, under the watchful round eyes of the pills the doctors' plied her with, her friends are starting to find her a little...boring. 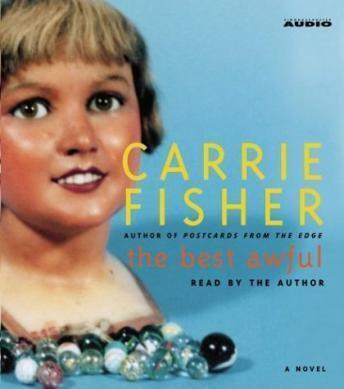 Based on a truant's story, The Best Awful is Carrie Fisher's most powerful and revealing novel: hilarious, moving, and fully informed by the wisdom of a true survivor. But nothin ever really happened. A shame as Carrie Fisher is so clever. I just didn't get this book. I kept waiting for something to happen, but it didn't - it seemed like a "day in the life" type of book, without any real plot or anything eventful occurring. I gave up and stopped listening after the second CD. Maybe it got better after that, but I just couldn't stand it anymore. Honest and entertaining book about manic-depressive illness. Author is down-to-earth and funny, even though she is Debbie Reynold's and Eddie Fisher's daughter.